I don’t often write about perfumes on here… in fact, I can’t ever remember doing so before. I have never been concerned with ‘vintage’ scents – I actually quite intensely dislike some of the more famous old names like Shalimar and Chanel no. 5. On myself at any rate – No. 5 smells amazing on Jeni, but terrible on me. I go for rose perfumes on the whole, sometimes fruity ones, and rarely vanilla-based ones. So when I was asked if I’d like to try a sample of a scent inspired by none other than GIN, I was most intrigued. I am, as you know, a fan of gin. To drink, that is. I have never been especially fond of the smell of it, though, so I hadn’t expected to like Penhaligon’s Juniper Sling. But it’s a very interesting scent, and interesting is my favourite thing. And the deco packaging is lovely. On to the important part… Well, it does smell an awful lot like gin and tonic, I have to say. At least on first opening of the vial I received. So I half-expected to smell like I’d spilled a glass of said libation down myself… but actually it mellows out to something sweeter. According to the website, the base notes are Brown Sugar, Black Cherry, Vetiver, and Ambrox… not being a perfume aficionado, I have no idea what the last two are; but I like ’em. It’s a unisex scent, and was, of course, inspired by the Roaring Twenties and the so-called Bright Young Things. 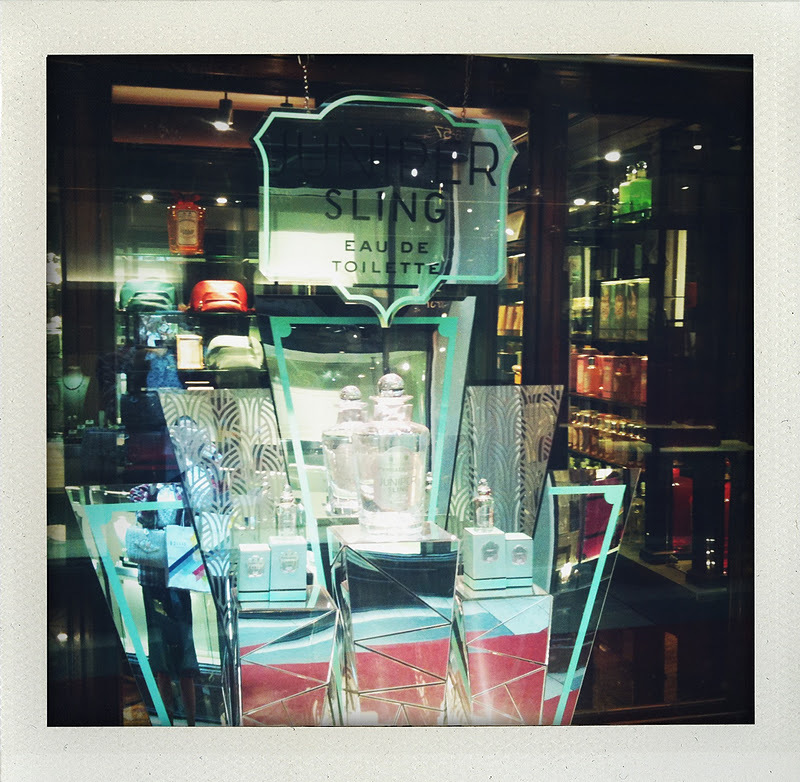 Thus, the Art Deco merchandising of Juniper Sling appeals to me greatly. The window display I saw and snapped outside Penhaligon’s of Burlington Arcade is smashing. And while the waist-less fashions of the 1920s don’t suit me at all, they do please me aesthetically. The well-dressed misbehaviour of the Bright Young Things is, of course, something I wholeheartedly agree with! So I’m glad that Penhaligon’s have gone for a lighthearted approach to marketing. This tongue-in-cheek promo video is just the ticket. With the recent return of Boardwalk Empire, I’ve a feeling that Roaring Twenties parties are going to be all the rage this winter. I was delighted to find out that Leluxe Clothing, a US-based brand I posted about on here years ago, have launched a UK-based site which is run by the amazing Vicky of Vintage Tea Sets! The Leluxe Clothing UK site is still under development, but catalogues can be ordered and enquiries made. The gowns are exceptionally amazing, and without the delicacy and huge expense of genuine 20s articles. My mum is coveting many of these glamorous confections! Once you’ve sourced your perfect frock, all you need do is add a bandeau headband or beaded cap and a smoky eye (I love Soap & Glory‘s new Lid Stuff palettes), and you could give It Girl Clara Bow a good run for her money. If she was still with us, of course. But because I’m just that wild and crazy that when I go to 1920s themed events (the Candlelight Club for instance), I just go 1940s. As do most of the rest of the Maf. 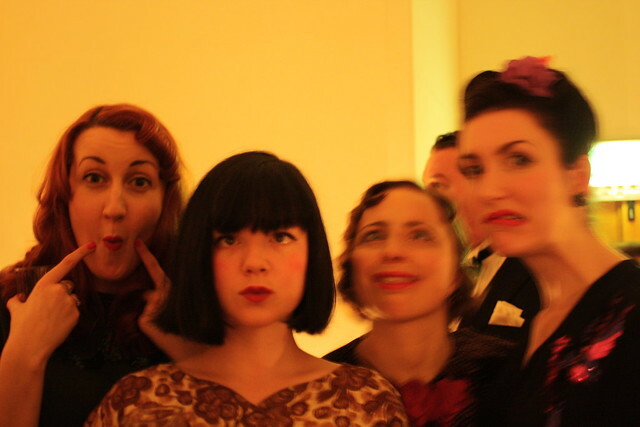 But when we’re there we’re quite flapper-ish in our behaviour anyway, so never mind, eh. As seen making waves (or rather faces) at the Candlelight Club. So anyway. Penhaligon’s Juniper Sling. It smells lovely, very much evoking the scent of a fresh G&T but without making you seem like a lush. Not more of one than you already are, anyway. 😉 Go and check it out and have a sniff of it at your earliest opportunity. I leave you with one of my favourite gin cocktails – the Aviation – as described in Hugo Ensslin’s Recipes for Mixed Drinks, published in 1916. PS. This post was indeed sponsored by Penhaligon’s, but I only write about awesome, cool and splendid things. Life’s far too short to be boring and/or smell bad. Vetiver is a root, it has quite a green, astringent note to my nose, which might explain its presence in a gin-inspired perfume. Ambrox is an aromachemical, but one which has been around for about 60 years; it's a non-animal substitute for ambergris. As you don't like vintage perfumes, if you come across any old bottles, let me know 🙂 I'm an addict! How apt! I am indeed attending a 1920s soiree next weekend 🙂 I shall see if I can get my mitts on a bottle of this stuff inthe meantime, so I can really look, or rather, smell the part. Funnily enough, I was drooling over these dresses on the American site the other day. I love the way they look, but quite apart from the price, they don't suit me. I'm far too short and hourglass to carry them off….sigh. My grandmother wore such things and she and her sister infuriated their mother by shingling their hair. I just wish she'd kept her frocks and things! Everything is coming up alcoholic! Fabulous! MMMm, I want EVERYTHING on this page. Yikes! I so want to try this, but it looks like, while they ship various fragrances to the States, this isn't one of them. Drat! Ooh I agree with Chanel No. 5, it makes me smell like an old lady. And not a cool old lady like I aspire to be, but a stinky old lady! Though I quote like the newer Coco Mademoiselle. The Penhaligon's packaging is amazing! I have the Demeter gin & tonic fragrance and it is a bit hard going. How adorable! I'm very particular with my scents too, steering clear of vanilla based and heavy musk scents. But I do love a good G&T so I'm sure I'll like this, and as stated, I'm won over entirely by the adorable advertisement! I love the styles of the twenties and those waistless dresses actually suit me as they cover my tummy. Those dresses look amazing. Just what I need for a Christmas party.